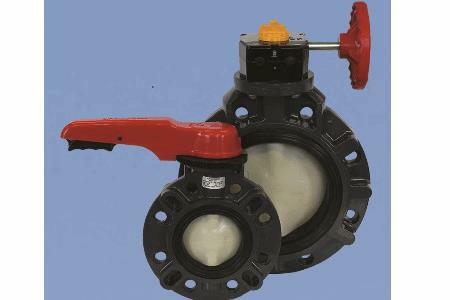 New features of the Type-57P include two molded tag holes in the valve body for user-defined valve identification, and a highly visible throttle positioning plate. The plate, which features an opening degree legend in 10-degree increments, makes accurate throttle positioning between zero degrees (closed) and 90 degrees (open) possible. The Type-57P’s body and disc are injection molded for durability, and the 316 stainless steel stem is non-wetted. For high cycle life and smooth torque, the seat and disc bushings have been fitted with dual O-ring seals. hi/America’s Type-57P is assembled to customer specification and tested in our Lawrence, MA facility. Available accessories include stem extensions, chain operators, manual limit switches, 2” square operating nuts, and Asahi/America’s Speed Handle for the Plasgear operator. The Type-57P is ideal for water and wastewater treatment, landfills, aquariums, chemical processing, swimming pools and water features, power plants, and mining applications. Asahi/America, Inc. specializes in providing solutions for fluid handling systems, individualized to meet virtually any customer’s need. Asahi is a leading manufacturer of corrosion resistant thermoplastic fluid handling products including valves, actuators, pipe and fittings. The company maintains an extensive custom fabrication department, and provides on-site consultation, supervision and training where required. For more information, visit www.asahi-america.com.